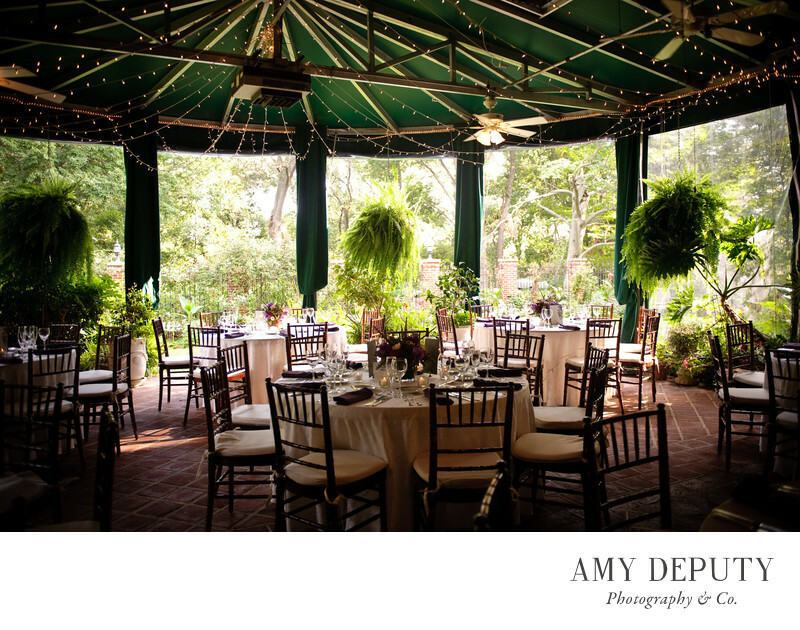 The Gramercy Mansion with its fabulous atrium (pictured above) is one of the very best Baltimore wedding reception venues, especially for couples seeking a garden wedding with the shelter of an indoor setting. Wedding receptions held in the atrium feel as if they are in an enchanted garden. The large, floor-to-ceiling windows bring the outdoors in and a view of shady trees and flowering plants surrounds guests as they dine under a canopy of green, highlighted by sparkling lights. Potted and hanging plants add a verdant lushness while the the red tiles at foot create a warm patio vibe. Each wedding I have photographed here has an elegance to it due to these lovely surroundings, whether the theme was relaxed or formal. Year after year, The Gramercy Mansion is always one of my top Baltimore wedding venues. Location: Gramercy Mansion: 1400 Greenspring Valley Rd, Stevenson, MD 21153.